A series of Farmer Field Schools (FFS) are being held in Dominica for extension officers, on cassava production. 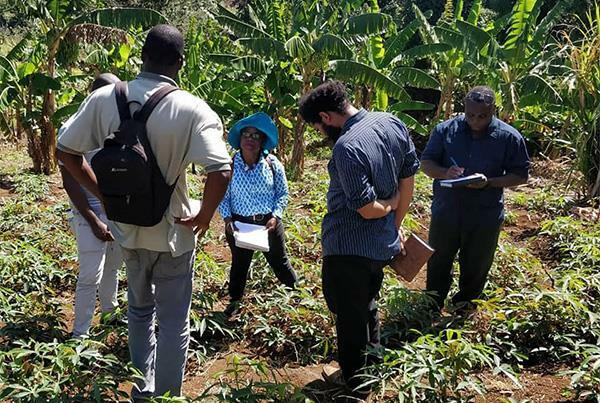 CARDI and the Food and Agriculture Organization of the United Nations (FAO) are working together to assist extension officers enhance their knowledge and practical skills so they are better equipped to advise and serve cassava farmers. 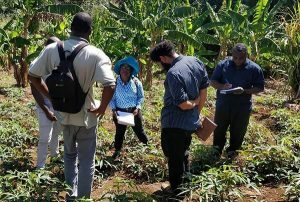 Rebuilding the Cassava industry has been prioritized for Dominica after the passage of hurricane Maria in 2017. Inherently a resistant crop, Cassava is also important for food security, economic growth and rural development. Dorian Etienne, CARDI Representative in Dominica said that “a value chain approach is being used to guide the training sessions”. A baseline study was conducted to inform the development of the training needs. Some of the topics covered to date included soil testing and preparation, plant nutrition, pest and disease management and selection and preparation of planting material. The FFS approach takes place in a field setting where the extension officers are able to discuss, discover, experiment and develop strategies and best practices for managing on farm issues. By being part of the decision making process, information exchange and learning by doing extension officers will be better able to advise cassava farmers on practical production issues. Calibishie village on the north east coast of Dominica was the site of the training sessions.